Upon arrival into Lima International Airport, you will be met by our representative and transferred to your hotel. Our representative will assist you with check-in procedures and provide you with a detailed itinerary, vouchers covering all the services included in your tour and additional information on the organization of your Peru trip. You will also receive a contact information sheet with all the hotel details as well as our offices contact information for each city and a 24-hour emergency number. Today you will enjoy a full day guided sightseeing tour to the most attractive and important sites of the "City of Kings". Lima has a lot to offer which includes the Historical Center, passing by Plaza San Martin, Plaza Mayor, Government Palace, City Hall, the Cathedral and its Religious Art Museum, closed on Sunday and Saturday pm; Santo Domingo Convent is provided instead on these days as well as San Francisco Monastery and its famous underground crypts known as the Catacombs. Your visit continues driving through the residential districts of San Isidro and Miraflores, passing by El Olivar Park, surrounded by iconic olive trees brought from Spain in the XVth Century, Huaca Pucllana, a ceremonial and administrative centre which belongs to the Lima Culture, built in the II Century AC, considered by the Incas as "Ñaupallaqta" or Sacred Town; Central Park of Miraflores and El Parque del Amor. El Parque del Amor or Love Park is located on the seaside cliffs of Miraflores overlooking the Pacific Ocean, is a beautiful natural lookout, where the waves of the Pacific roll in towards the coast below the Morro Solar in Chorrillos at a distance. After the tour, return to your hotel. After breakfast at the hotel you will be assisted to board your flight to Cusco. Upon arrival to Cusco's airport our representative will assist you with your luggage and drive you to the hotel. Rest of the morning at leisure for your complete adjust to the altitude. 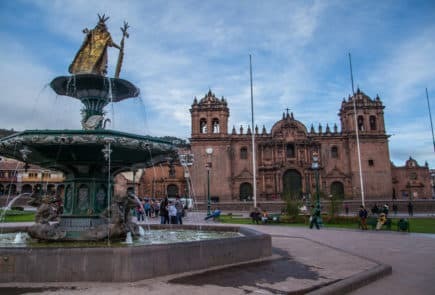 PM: A guided visit to the Imperial City of Cusco including the main square, home for historical events, its Main Plaza and the Cathedral that beholds hidden wonders of the Spanish conquest. It holds astonishing local art and antiques that become part of its unique construction including great slabs of red granite in renaissance style contrasting with the baroque style silverwork which decorates the whole interior. Following the Cathedral is the Santo Domingo Church built upon the foundations of the Incan Empire temple: Koricancha dedicated to Sun worship. Later on head to the City’s nearby ruins of the outstanding fortress of Sacsayhuaman, a magnificent architectural example of the Inca´s military power. After this Qenqo rebirths on a ritualistic type of site bring in you subterranean galleries that form an underground maze. Puca Pucara, also known as the “red fortress” brings to the final stopover at Tambomachay, also known as the Incan Sacred Baths. After the tour drive back for an overnight stay at your hotel in Cusco. Your guide will meet you at your hotel early this morning. You will be driven to the train station to board the Vistadome train, for a dramatic train ride to Machu Picchu (6180 feet), the great mountain-top city abandoned by the Inca Empire, reclaimed by the jungle and lost to humanity until its rediscovery in 1911. The legendary 'Lost City of Machu Picchu' is without a doubt the one of the world's most impressive archaeological sites. Built by the Incas on the summit of "Machu Picchu" (Old Peak), overlooking the deep canyon of the Urubamba river in a semi-tropical area 120 Km. (75 miles) from the city of Cusco at 7,000 feet above sea level. It sits on a mountain site of extraordinary beauty, in the middle of a tropical mountain forest; Machu Picchu was probably the most amazing urban creation of the Inca Empire at its height, with its giant walls, terraces and ramps, which appear as though they have been cut naturally in the continuous rock escarpments. Machu Picchu is also one of the Inca's best kept secrets, since they did not left written records and Spanish chronicles make no mention of the citadel, it remains a mystery. Upon arrival to the ruins, a guided tour of the lost citadel. Lunch included at local restaurant. In the afternoon return to Aguas Calientes town. Excellent opportunity to wake up early and enjoy a beautiful sunrise as well as stroll around the Town of Aguas Calientes and visit its Hot Springs Thermal waters. Then, you will have time to perform some of the following activities (not included in the overall price): visit the Citadel of Machu Picchu for a second time, or for more active and adventurous people, we suggest to climb up the Huayna Picchu from where you can appreciate the immensity of Machu Picchu, even more amazing being so high and distant (no guide services included this day). In the afternoon, return to Cusco by train and upon arrival at the train station you will be met by our representative and private driver for your transfer to the hotel. Transfer to the airport. Arrival to Lima and assistance with all departure formalities for your international homebound flight. Upon arrival Iguazu airport you will be assisted by one of our representatives who will take you to the hotel and help you with the check-in procedures. Then, depart on a guided tour to the Cataratas Argentinas (Argentinean Falls). The UNESCO organization declared this place World Heritage in the year 1984. Paseo Inferior (Lower Circuit) : this circular 1.200-metre-walk will let you have a great view of the majority of the rapids and falls by giving you front and a upward bound views with various distances ranging from ample landscape bird eye views of Garganta del Diablo (Devil’s throat) and many Brazilian rapids up to spectacular close ups. Should you want, you will be able to enjoy the Salto Bossetti (Bossetti Fall) side showers. The amount of time necessary for this stroll is approximately 2 hours. This walk has a little high difficulty level due to the amount of steps it bears. Paseo Superior (Higher Circuit): it is a 1.300 metre-round-trip circuit. The elevated catwalks will raise your adrenaline levels while taking you over the fall lines of several of the main white waters all the way to feel the vertigo at the very edge of them. This delivers a unique complete breathtaking scenery outlook from a high point of view. The length of this second stroll is 1 hour. This is the less effort demanding walk of the three traditional ones. It has no steps. Garganta del Diablo: to access this site you will have to take the Tren Ecológico de la Selva (Ecological Jungle Train), and you must get off at the stop having the same name, Garganta del Diablo. From there you will start a stroll by the very safe new catwalk which is a long and winding path that goes around the islands for 1.100 metres all the way to the large balconies located on the edge in front of Garganta del Diablo. The amount of time necessary for this promenade is approximately 2 hours and it has no steps. coach system with panoramic units for the people to move safely within the park. The length of the catwalks is 1.200 metres from where you will get a stunning view of the 275 Saltos (waterfalls) which are called Cataratas del Iguazú. On the Brazilian side the four main rapids are: Floriano, Deodoro, Benjamín Constant and Salto Unión or Garganta del Diablo. Then, you will be transferred to the airport to take your flight to Buenos Aires. Upon arrival, you will be assisted by one of our representatives who will take you to the hotel and help you with the check-in procedures. Then, depart on a guided tour to the most important places in Buenos Aires. The tour includes the Metropolitan Cathedral, Government House and the area of Plaza de Mayo. You will be at the heart of the Tango activity where this sensuous dance is performed in the street for passersby to enjoy in the traditional neighborhood of San Telmo, where this typical dance dwells. Then you will visit La Boca and stop at this colorful suburb of the city adopted years ago as his home by the first Italian immigrants. Today is home for important artists. Then, a visit to Palermo is scheduled, a residential neighborhood with parks and elegant buildings. Finally, you will visit the sophisticated Recoleta, one of the most exclusive neighborhoods in which among other attractions, you can take a look at the famous cemetery alongside fine restaurants and cafes. Optional: At sunset, we suggest you to assist to a Dinner Tango Show to enjoy the glamour, beauty and sophistication of the best music in Argentina. (Not included). Breakfast will be served at the hotel. At the set time, you will be transferred to the international airport to take your flight to return home. Rates valid for 2015 except on Holly Week dates (April/ 24-31), Christmas & New Year (Dic 17-18 Jan) and other National or Religious Holidays which may have special rates; please verify. 02 nights accommodation in Lima. 02 nights accommodation in Cusco. 01 night accommodation in Aguas Calientes. 02 nights accommodation in Iguazú. 03 nights accommodation in Buenos Aires. HD Buenos Aires city tour. Permanent assistance during the trip.